Marlin, aka Help's On the Way, is a handsome red brindle male, born October 20, 2000. Marlin's racing career started in April 2002 and ended on March 8, 2003 in Texas. He is out of the Dutch Bahama bloodline. Marlin loves to play with balls and toys and is a friendly, happy boy. His tail was injured and has been docked. It is not known at this time if he is cat or small animal tolerant. Marlin was adopted to what he thought was his "forever" home but was recently found at the SPCA in Houston - what a journey that must have been. Marlin is now lounging in a foster home in Austin. Marlin is a tall male with a short tail, but he doesn't miss his tail at all. His nub of a tail is always wagging. He had an easy adjustment into his foster home. Marlin has impeccable house manners. He does not counter-surf or get on the furniture. He learned to use the dog door so there are no accidents in the house. There's no need to crate him because he is so well trained. I would trust him anywhere. In the summer he even liked to get a bath with the water hose in the back yard. Since being here, he's picked up only good habits. 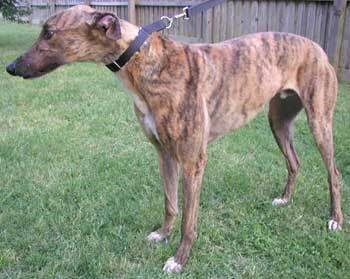 He's a typical Greyhound, that is, he wants to be with you and will follow you everywhere (with that wagging tail). He's a beautiful brindle boy with clear brown eyes (what's not to love). He loves everyone and isn't the least bit shy about showing his affection, but he's a very gentle, sweet boy. At night he curls up on a dog bed in the bedroom and dreams of finding a forever home. Marlin's walks are one of the highlights of his day. He finds it fun to watch for squirrels and cats but he doesn't lunge for them  he just watches them very closely. Car rides rank right up there with walks for Marlin. He just likes to "go." Marlin loves to join in play with the other Greyhounds in his foster home. He barks at them if he isn't getting enough action. He often gets caught up in the moment  there are some times when you just have to bark! Marlin was originally adopted into a home with children and still seems to love them. 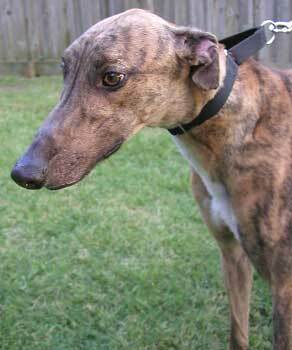 He's a very low-maintenance boy that would make an ideal dog for someone who has never had a Greyhound.